Reading and share top 7 famous quotes and sayings about Springtime Love by famous authors and people. 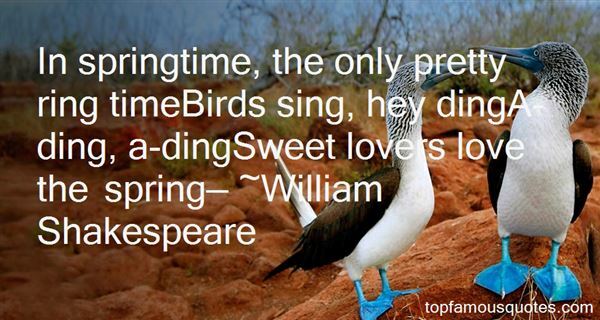 Browse top 7 famous quotes and sayings about Springtime Love by most favorite authors. 1. "A Robin said: The Spring will never come,And I shall never care to build again.A Rosebush said: These frosts are wearisome,My sap will never stir for sun or rain.The half Moon said: These nights are fogged and slow,I neither care to wax nor care to wane.The Ocean said: I thirst from long ago,Because earth's rivers cannot fill the main. —When Springtime came, red Robin built a nest,And trilled a lover's song in sheer delight.Grey hoarfrost vanished, and the Rose with mightClothed her in leaves and buds of crimson core.The dim Moon brightened. Ocean sunned his crest,Dimpled his blue, yet thirsted evermore." 2. "Every time I look down on this timeless townWhether blue or gray be her skies.Whether loud be her cheers or soft be her tears,More and more do I realize:I love Paris in the springtime.I love Paris in the fall.I love Paris in the winter when it drizzles,I love Paris in the summer when it sizzles.I love Paris every moment,Every moment of the year.I love Paris, why, oh why do I love Paris?Because my love is near." 3. "Sweet spring is yourtime is my time is ourtime for springtime is lovetimeand viva sweet love(all the merry little birds areflying in the floating in thevery spirits singing inare winging in the blossoming)lovers go and lovers comeawandering awonderingbut any two are perfectlyalone there's nobody else alive(such a sky and such a suni never knew and neither did youand everybody never breathedquite so many kinds of yes)not a tree can count his leaveseach herself by openingbut shining who by thousands meanonly one amazing thing(secretly adoring shylytiny winging darting floatingmerry in the blossomingalways joyful selves are singing)sweet spring is yourtime is my time is ourtime for springtime is lovetimeand viva sweet love"
4. 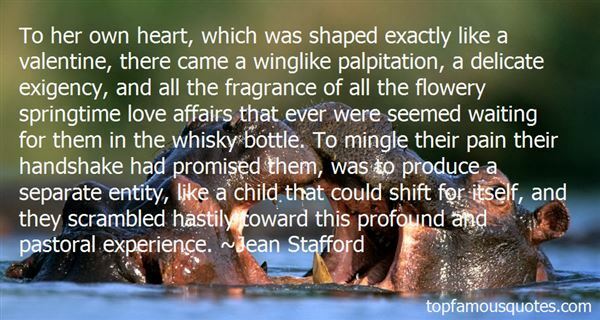 "To her own heart, which was shaped exactly like a valentine, there came a winglike palpitation, a delicate exigency, and all the fragrance of all the flowery springtime love affairs that ever were seemed waiting for them in the whisky bottle. To mingle their pain their handshake had promised them, was to produce a separate entity, like a child that could shift for itself, and they scrambled hastily toward this profound and pastoral experience." 5. "Well," he said slowly, "sometimes there's a passion that comes in its springtime to ill fate or death. And because it ends in its beauty, it's what the harpers sing of and the poets make stories of: the love that escapes the years...."All or nothing, the true lover says, and that's the truth of it. My love will never die, he says. He claims eternity. And rightly. How can it die when it's life itself? 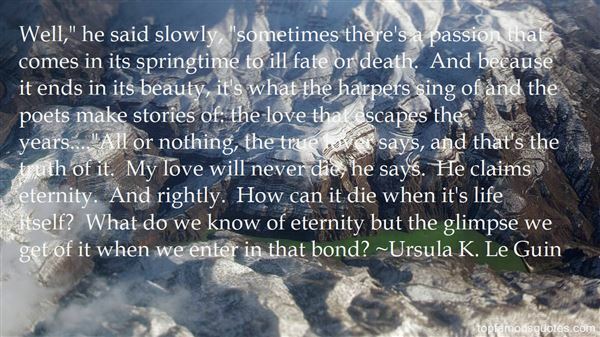 What do we know of eternity but the glimpse we get of it when we enter in that bond?" 6. "Poetry reveals to us the loveliness of nature, brings back the freshness of youthful feelings, reviews the relish of simple pleasures, keeps unquenched the enthusiasm which warmed the springtime of our being, refines youthful love, strengthens our interest in human nature, by vivid delineations of its tenderest and softest feelings, and through the brightness of its prophetic visions, helps faith to lay hold on the future life." 7. "In springtime, the only pretty ring timeBirds sing, hey dingA-ding, a-dingSweet lovers love the spring—"
Each person has a literature inside them."